As a 100% Member, all member providers of the Alliance are therefore full members in the National Council. The National Council for Behavioral Health is the unifying voice of America’s mental health and addictions treatment organizations. Together with 2,800 member organizations, serving 10 million adults, children and families living with mental illnesses and addictions, the National Council is committed to all Americans having access to comprehensive, high-quality care that affords every opportunity for recovery. The National Council was instrumental in bringing Mental Health First Aid to the USA and more than 600,000 individuals have been trained. In 2014, the National Council merged with the State Associations of Addiction Services (SAAS). To learn more about the National Council, visit www.TheNationalCouncil.org. A not-for-profit 501(c)(3) association, the National Council for Behavioral Health’s mission is to advance members’ ability to deliver integrated health care.The National Council advocates for policies that ensure people who have mental health and substance use problems can access comprehensive healthcare services. We also offer state-of-the-science education and practice improvement consulting and resources to ensure mental health and addiction services are efficient and effective. 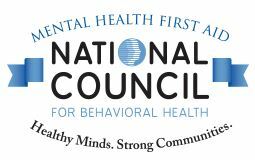 The National Council operates Mental Health First Aid USA to educate the nation on behavioral health disorders and the SAMHSA-HRSA Center for Integrated Health Solutions to provide nationwide technical assistance on integrating primary and behavioral health care. We offer the annual National Council Conference featuring the best in leadership, organizational development and excellence in mental health and addictions practice. National Council Magazine, National Council webinars and our Journal of Behavioral Health Services and Research offer in-depth perspectives on current trends and hot topics in mental health and addictions, like suicide prevention, trauma-informed care, the future of behavioral health, treating addictions as a disease, care for children and youth, integrated health care, population health, crisis services, criminal justice, mental health collaboration, and more.